I'm in my second year with my Tiger Blogging Club, and some great additions to our work has helped the students reach further in their blogging in so much less time than last year. I think these things can be applied to the classroom, too, so I wanted to share. First, my club consists of 4th and 5th graders. I have five fifth graders and eight fourth graders. Having a group of returning kiddos is SO SO helpful for instruction. They are models who have a background with edublogs and naturally, they help me coach the fourth graders on their work. The first week, I asked them to set a goal. They didn't know a sticker chart - one where we'd track how often we met our goals - was coming, but in my mind, I knew I'd put that up next week. 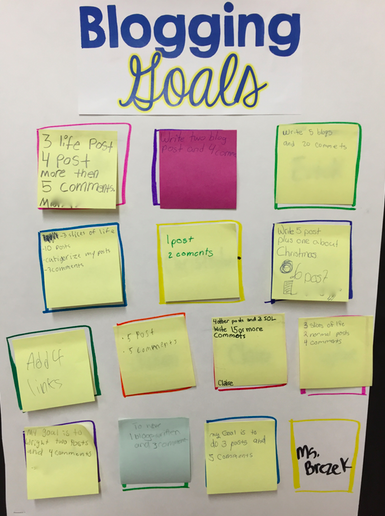 When they returned that following week, I stood by the sticker chart I had put up, asked who made their goals, and not one person had (myself included). At the end of that session, we took our old goals down from the board and set new ones. When the kids came back on the third week, they were so excited. As they trickled into our meeting, many checked their goals, told me they made them, and sat down happily to begin working on their blogs. 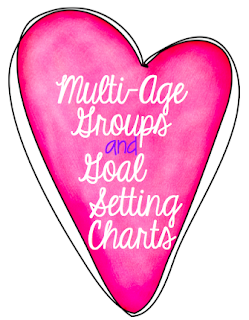 These two strategies - having a combo grade level club and a goal setting chart has led amazing work by my bloggers! Check out their blogs listed on my right sidebar under "Student Bloggers in the Loop." One of my kiddos hit a major milestone this week - she published her 100th post! Hope your last week before break is wrapping up well!